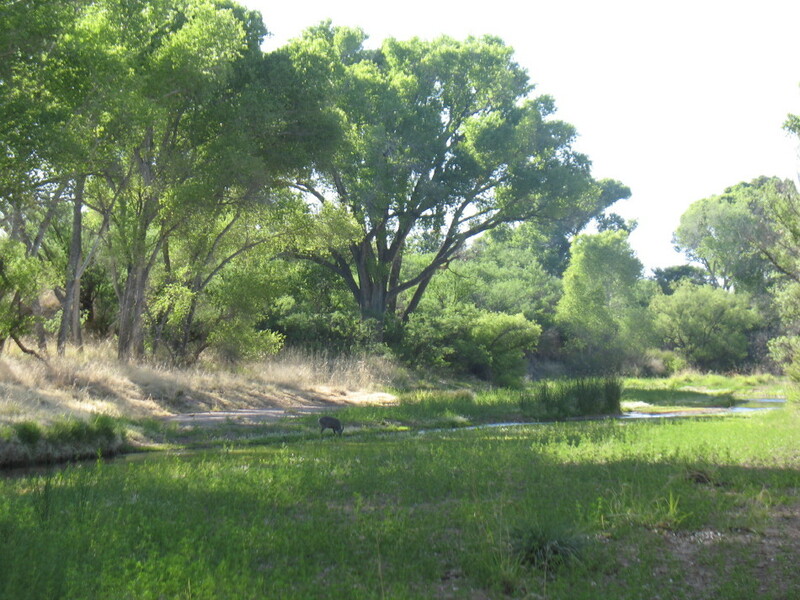 We awaken in into an Eden in the San Pedro River. It is time for a stripped down walk about. The direct sun quickly warms us under our coverings. The night had been chilly, we both agree. There is more humidity here, the air follows the current of the stream, perhaps the percolation and evaporation contribute, but that was last night and now things feel wonderful naked all over in this Eden. We discuss how little of the wildlife that we have seen. Our friend told us of javalina, coatimundi, turkey and more during her trip here a few weeks ago. I had heard a turkey gobble last evening. It was like the night previous to that. We do hear the sound of a cranky tree sometimes, when the wind blows, which is a similar sound. I had dreams, which lead me into uncomfortable feelings this morning. I feel off center. Before sliding into prayer, I stand naked in the sun and stretch. My eyes close, I ask for direction and serenity to accept discomfort. I find myself gracefully disappearing more into the moment in which I am living. When I open my eyes, prayers are answered. 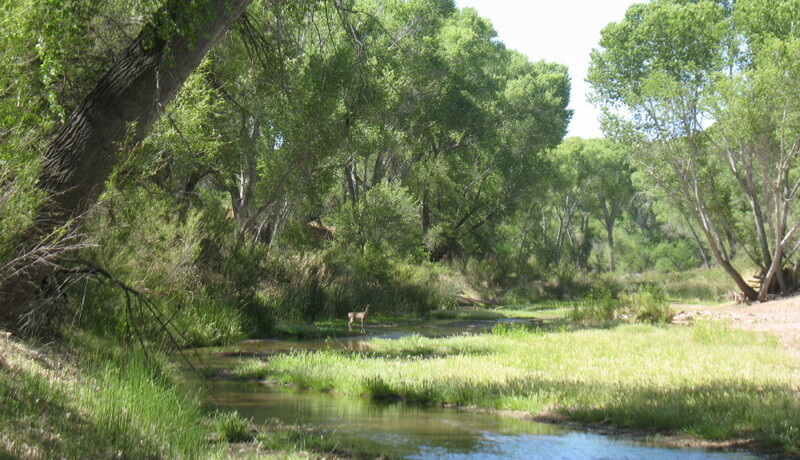 A deer is standing in the stream ahead of me. It is aware of me, but I have been standing so still and calm. I attempt communication non-verbally with the deer for a while. I hear DF behind me and the sound of her camera clicking. I hear another deer prance in the cluster of dry fallen leaves across the river. 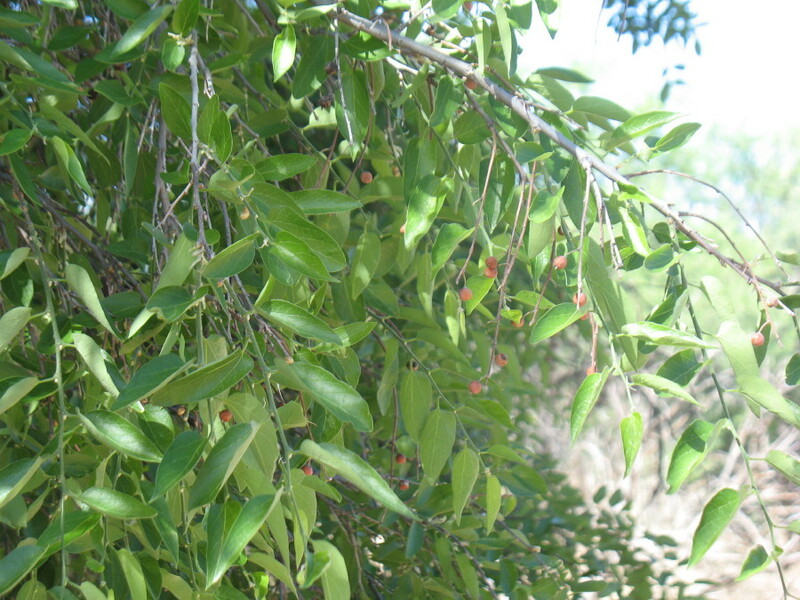 It is hidden in the trees up out of the river bed. In time, I see the deer suddenly turn its head and ears to its right. Another is following its lead a little further downstream. They are in a shady spot with just a little sunlight. I wonder if they associate; if they sense the cool of the shade with a feeling of a lessening of fear. They are less easy to see in the shade, if not hidden in their solid lack of movement. We move, the new one bolts and the first one follows, fright and flight. Their tails which plume strait in the air, are huge on their small bodies. The sun shines through the white fur and they look like a very fine feathered array. It is the way that light shines through prairie wheat. When I turn back, standing, as DF sorts out her belongings in the tent, I notice a shadowy figure in the distance downstream. I stop to stare, to be sure. There is a person, a silhouette standing in the shade of a massive tree, the sun illuminates behind it. It seems to be standing and staring intently. Perhaps it is a person thinking. After a time, with enough of a chance for this person to pass, or to make itself known, to decide, I must stir the waters. We would like to know who is in the vicinity. We are about to leave our belongings tied to one of several trees that we have picked out. I wonder if that person is being polite because it associates naked with privacy. I wonder if it is someone with textile weird thoughts. I need to know. I put a long t-shirt on and begin to walk toward the shadow, to relax all three of us. Just as I begin my approach, I see the shadow illuminated. It is an older woman, hobbling like she has damaged knees. She is walking away from us. I keep on and also find her with three large dogs. They are Husky-like, two white and one black. They follow her. I wonder where she came from with such legs and consider that she would have no fear with three large dogs. Perhaps the dogs are dangerous to us. I’ll never know. DF suggests that it is better to just go this morning. 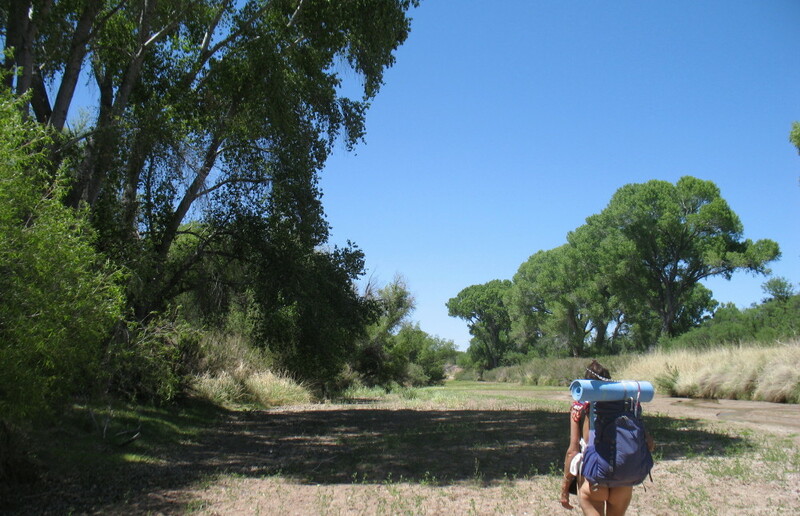 The plan had been to break camp and strap our bags to nearby trees for safekeeping. We have seen no problematic wildlife and a new day is beginning. Breaking camp now will eat away at the time. We eat some snacks and put on protective shoes. We take a camera and a bottle of water each. With our lack of everything else, we have been ready all along. The water is impossible to avoid for we two naked souls in this Eden. We are both surprised how much colder that the water is this morning. The evening cools such a shallow stream and the sun warms it. 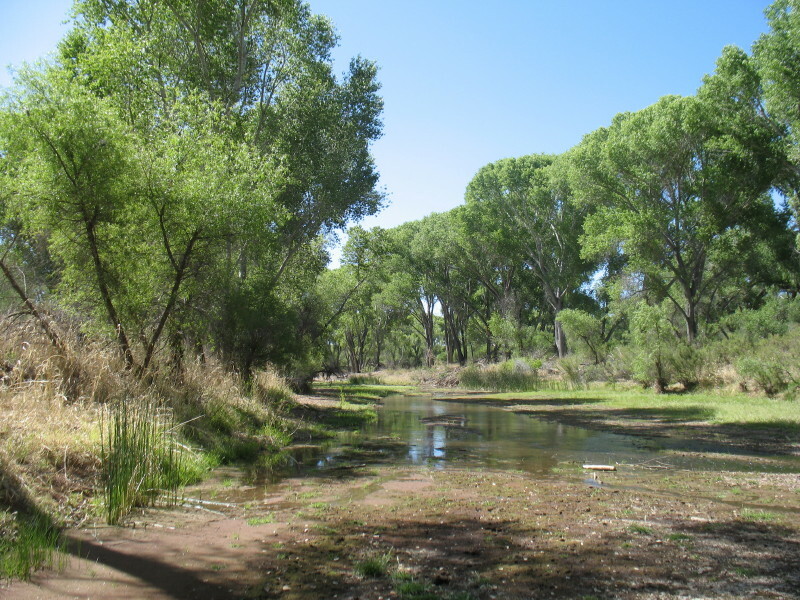 This river bed is shady and filled with wonder. We soon notice a tributary that we hadn’t noticed yesterday. It is a compelling mystery. 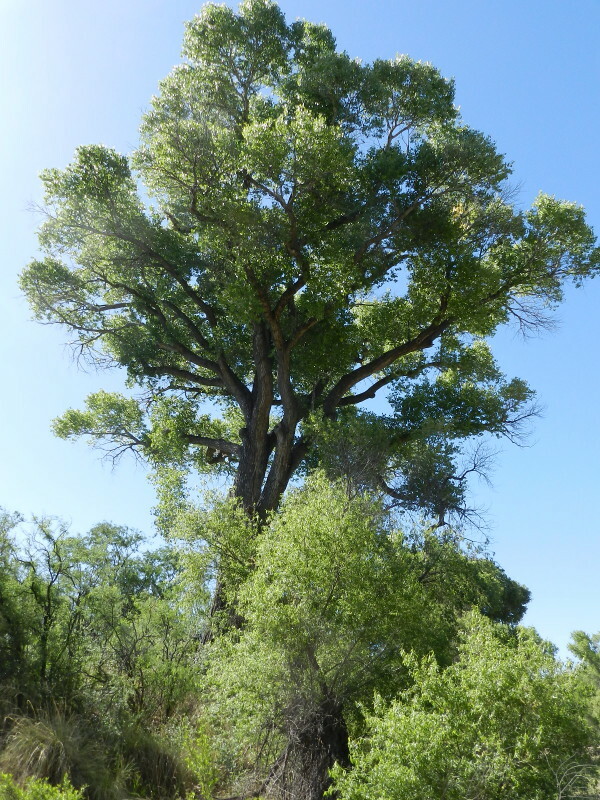 The walls are tall at the entrance, only holding on by the strength of the roots of a mighty and old cottonwood. The ledge hides what is above and beyond the cliff-like steep sides. All that we can see are the mesquite treetops. We come to a place to climb above and DF decides to investigate a wooded post. 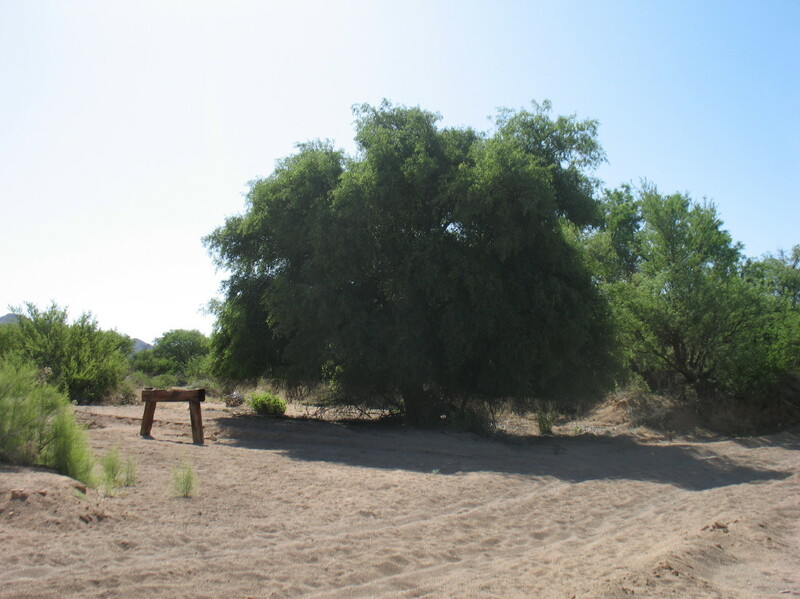 The mesquite is thick. Sometimes their exposed roots decorate the corridor. I see three small monuments in a row. Beyond that there is some kind of stone arch, like the gateway to a lost city. Soon enough, there are more arches. It is a concrete bridge supporting the old railroad bed. The monuments are remains of submerged posts, probably from an even older bridge. DF climbs up the side to confirm. There are more mesquite and posts up there. We venture to the bridge and then under. The wash widens considerably. The concrete bridge supports have some uprooted trees piled across them from floods. The flooding waters have reached this point a time or two and created a great swirling whirlpool. To the right, I see a large hole in the sand where a torrent spent some time circling, drilling. The water was massive and extremely powerful to do this. 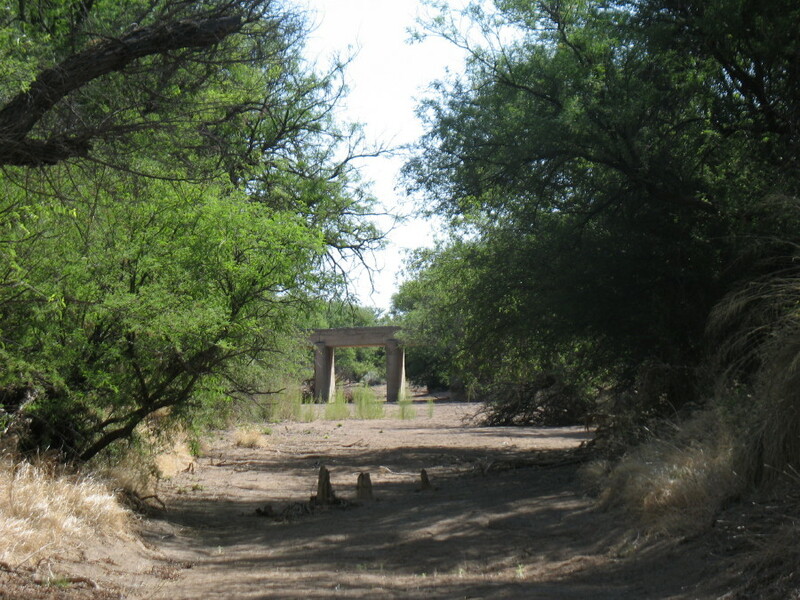 From here it had rushed under the bridge, funneling into our pathway, which then t-bones the San Pedro River. 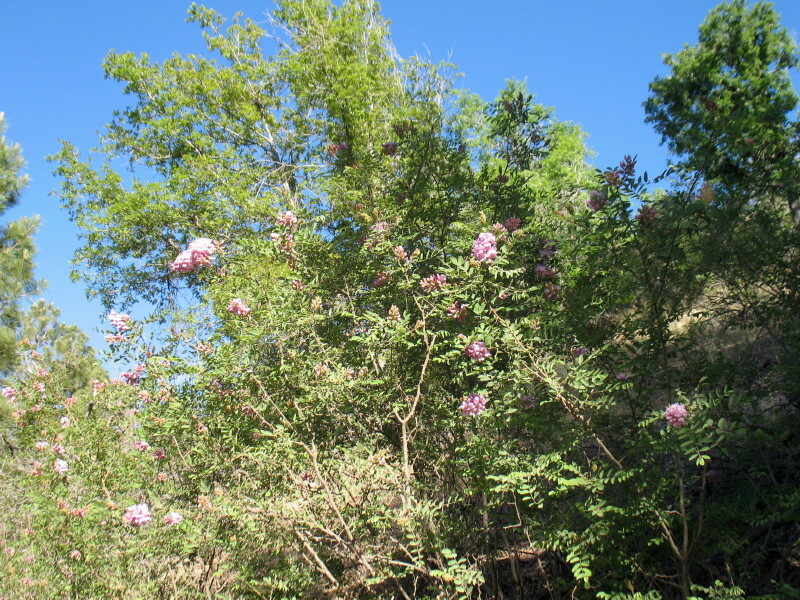 Here, just a hundred feet upstream, is an unusual tree that is flourishing near the tracks. I wonder if a seed was dropped years ago off of this old bridge by a passenger. In front of it, a large set of railroad ties is set up, like it is a hitching post ready to park a horse. I find another one buried in brush. The roots are uncovered as if it has legs. DF gets down to take a photo. There is a track through here from wheels digging in deep, passing through the sandy wash. We follow the trail as it leaves the wash. There is an old concrete foundation, which is probably an anchor for that other old wooden bridge. 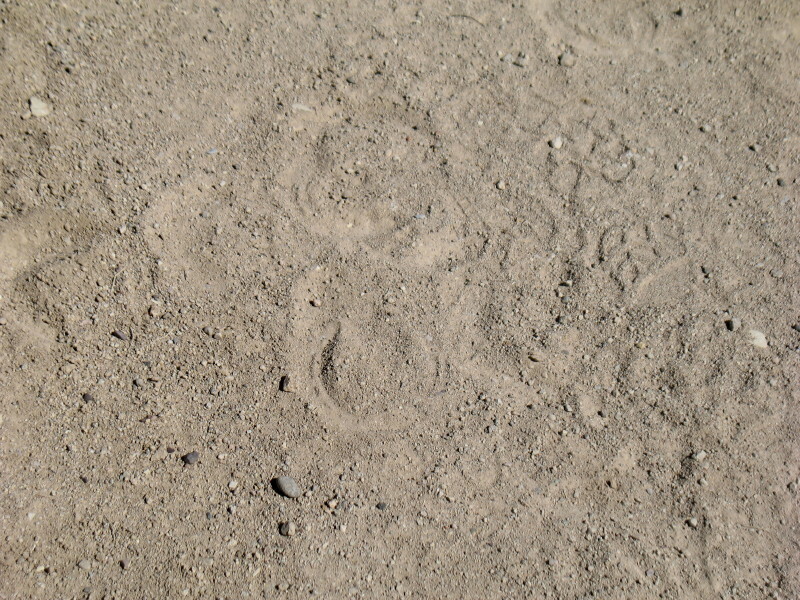 We see the prints of a horse. This would make a pleasant ride. The road goes somewhere, but nowhere that we are interested in right now, We turn around. 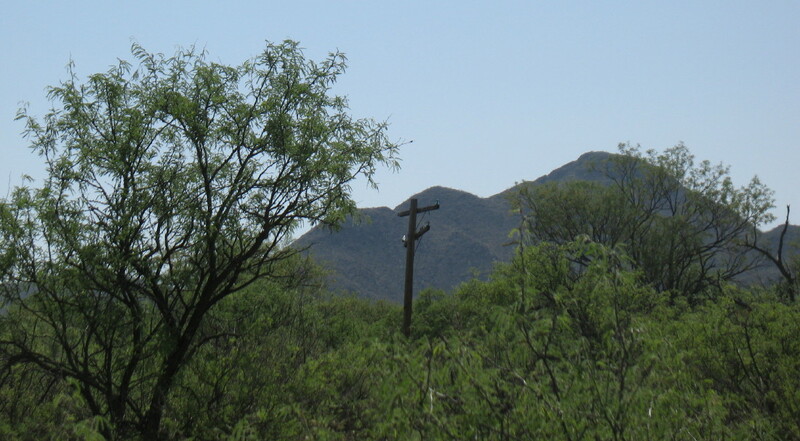 A relic telephone pole is out in the mesquite and brush. Anymore, no wires are attached to it. Just a few antique glass insulators decorate its wooden arms. We head back. A sort of miniature cliff dwelling has been carved by the rains. We have found our lost city. A lone flower catches our attention. Its prickly structure is a blue in contrast with the rest of this place. 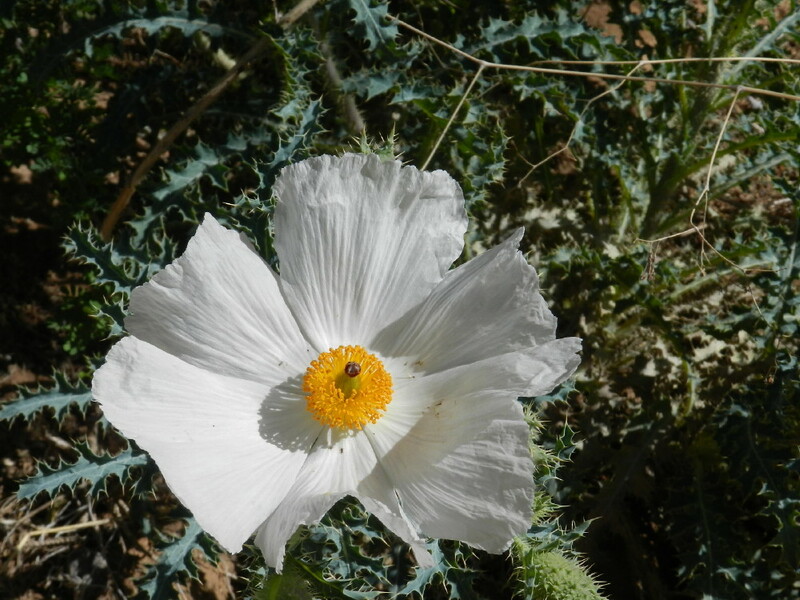 It has large white flower. We soon arrive where we left off last night. We know this as flies appear, the soil is trampled by four wide heavy hooves and an uncomfortable fresh odor fills our nostrils. This is where that lone black cow had strayed. The destruction of just one is remarkable. We pass this by quickly. Eden continues. More water flows as we continue up stream. We notice that by 10:00am that the water is already changing into a warmer temperature. A group of reeds brush up against us as we pass. We brush up against the reeds. DF is feeling them with her loving hands. She tells me that they are cool to the touch. They are sitting in the direct sunlight and still feel cool and refreshing. It is about an hour and a half into this morning exploration. We are ready to find a place to rest. We find a large fallen tree, the bark gone, thinking that this is a good place to sit. We eagerly head to it through an aromatic bouquet. There are however, needle-like pieces sticking out of this smooth inviting surface. Carefully, we find two gaps open enough to lean on. 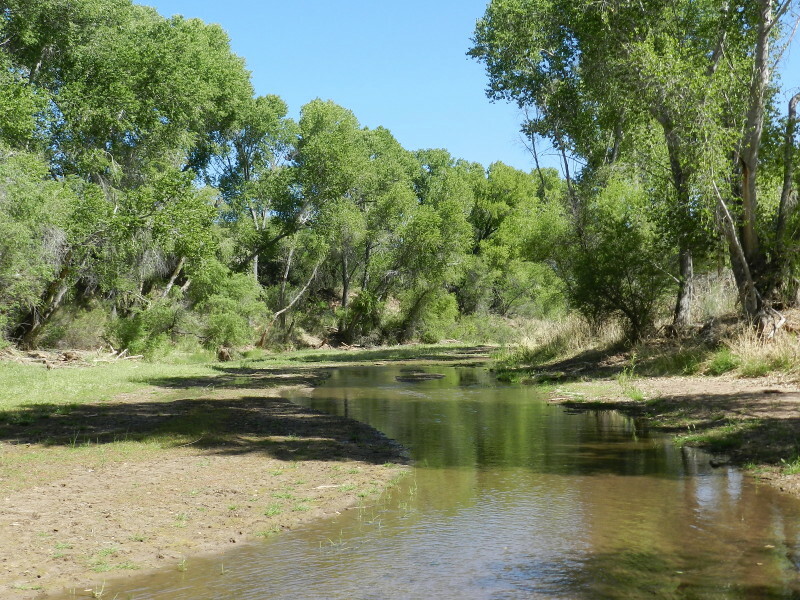 Here on this sandy bar, we view out at the massive two walls of cottonwood trees and the river’s pastoral carpet of green below. It feels idyllic. All that is needed is a great white brahma bull and we can see the Hindu gods dancing around spinning learned stories and casting blessings. Here we calmly rest, discussing the lack exciting wildlife, when I notice that a small deer has come out and is drinking from the stream. I’m alerted. I smoothly get up and stand watching with my camera. The deer is in the shade and I want it highlighted for a photo. DF is creeping up behind me. We spend half an hour waiting, watching. Another has appeared, and we are careful not to disturb them. As we turn to leave, our new movement makes them decide to bolt. The sun will soon be at an angle as to steal most of the morning’s shade. The more intense light an hour around noon has arrived. We have no coverings at all, so it is best to get back to our camp. We have plans later in the afternoon. 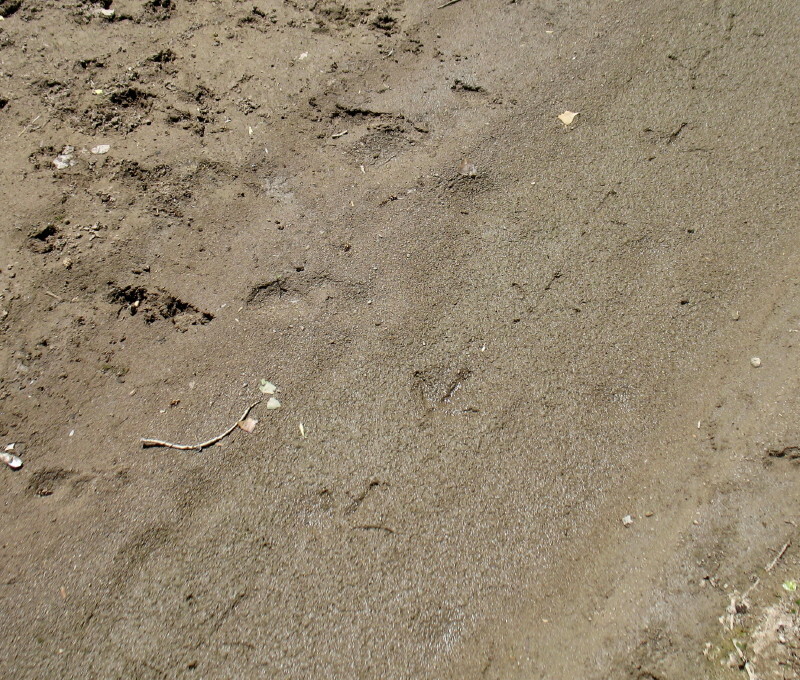 Everywhere, the river bottom reveals many tracks. 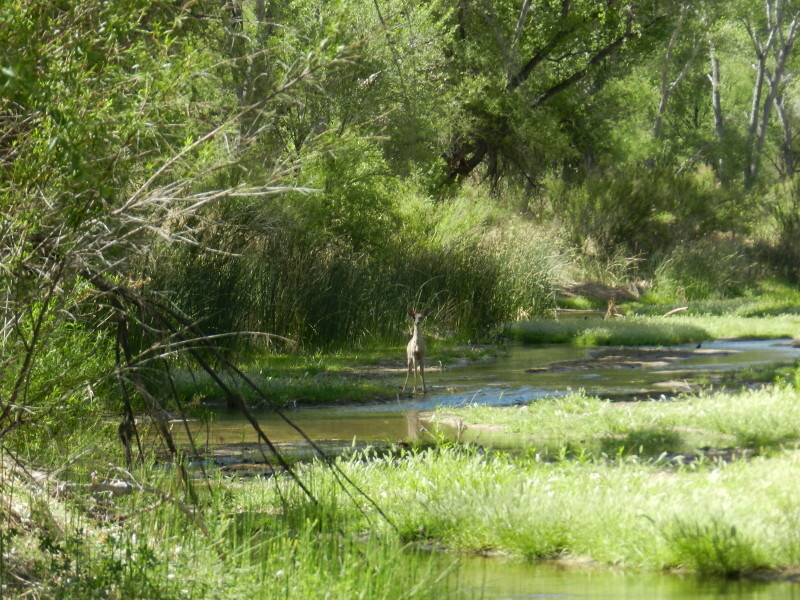 Coyotes and birds amongst the little toads. We debate whether we are looking at coatamundi, or raccoon tracks. We are stunned by the size and depth of a trail of turkey tracks. They are as big as my hand. They are extremely definitive. They look like some fossil print from prehistory. This bird is huge. Along our way, there are patches of blooming flowers. 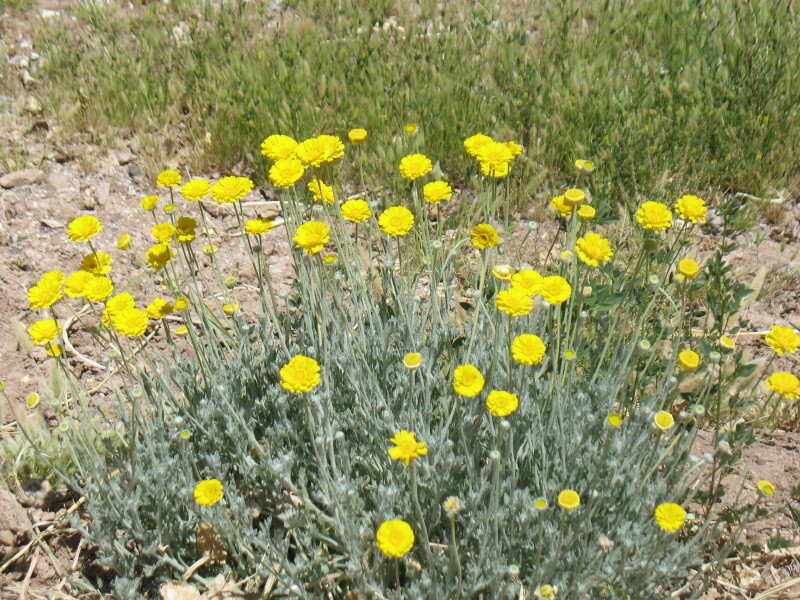 Not fields of flowers, just occasional plants or groupings. We stop at each new beauty. We seem to have gone through a time warp with our hurry and efforts to stay in the shade. We arrive back at camp quickly. Our timing is perfect. 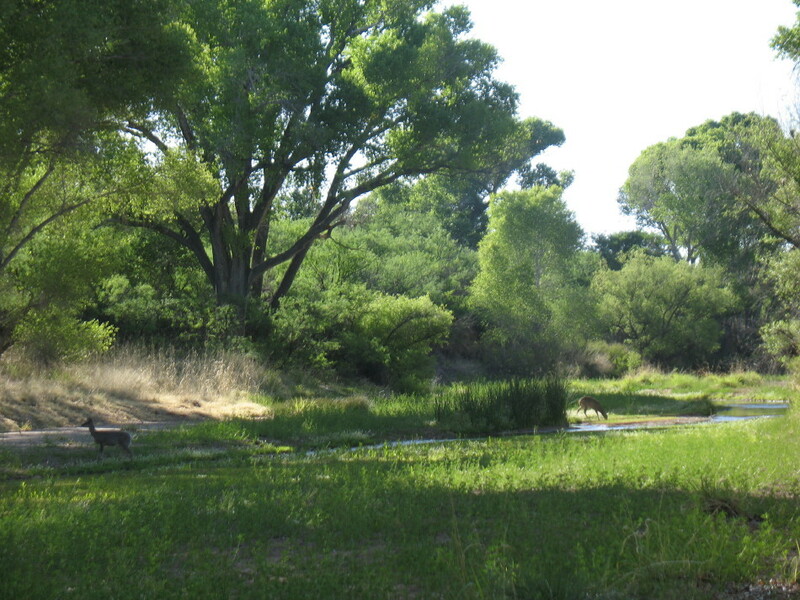 The tent is just returning to the shade of one of the huge cottonwoods. This will make packing up camp infinitely more comfortable and I won’t need to wear something to protect my shoulders until we leave. I doff my shoes and socks and enjoy my labor in the smooth firm sand, barefoot to the top of my head. DF heats up a brunch of oatmeal, strawberries, banana chips and cinnamon as I take care of the tent. The last chore is to gather and filter enough water for the walk back. We both stand in the comforting stream. As I dip the bag under the water to collect water, it appears that the stream isn’t as deep as before. I chalk it up as my being mistaken about the location. We comment that there have been very few ants. Could the water have been too wide and close to the surface for them? At the time, we don’t realize the clue that we have been given about the water table. We pack out, walking fast in the sun and slowing up, or resting in the shade. We are bothering two ducks again. 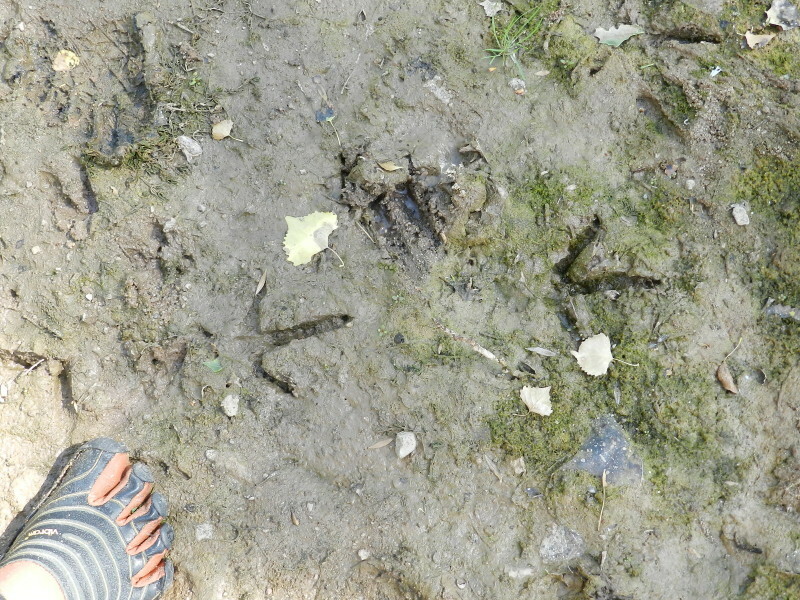 We find more turkey tracks, not quite as big, but strange, as each follows each other. It is as if the bird hops on one leg. We come to the bridge and find our time to reluctantly dress. 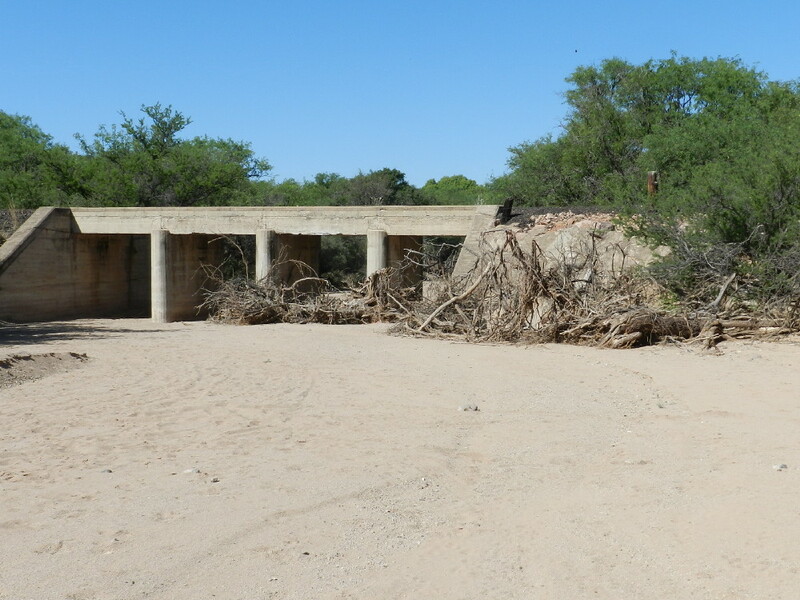 We are surprised to find that the river dries up a few hundred feet before the bridge today. Just yesterday afternoon, the water flowed as far as we could see on the other side of the bridge! This explains the ants and the problems getting drinking water. This place is drying up fast. There will be no rain until the monsoon season arrives. 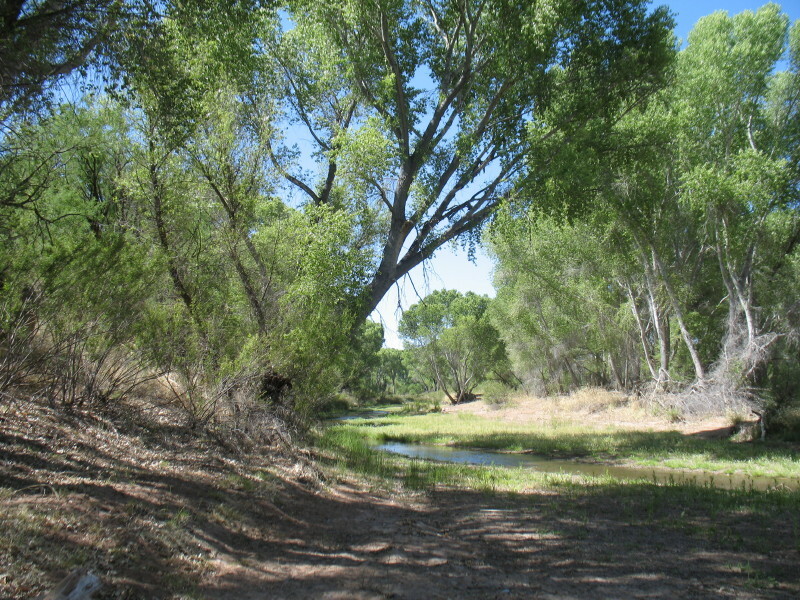 We make our way on the trail through the mesquite bosque and into town. I grab my kilt just in case, strip and eventually climb in the cab of the SUV. There is only one car in the parking lot. We have an agenda of three things during our epic carnude. 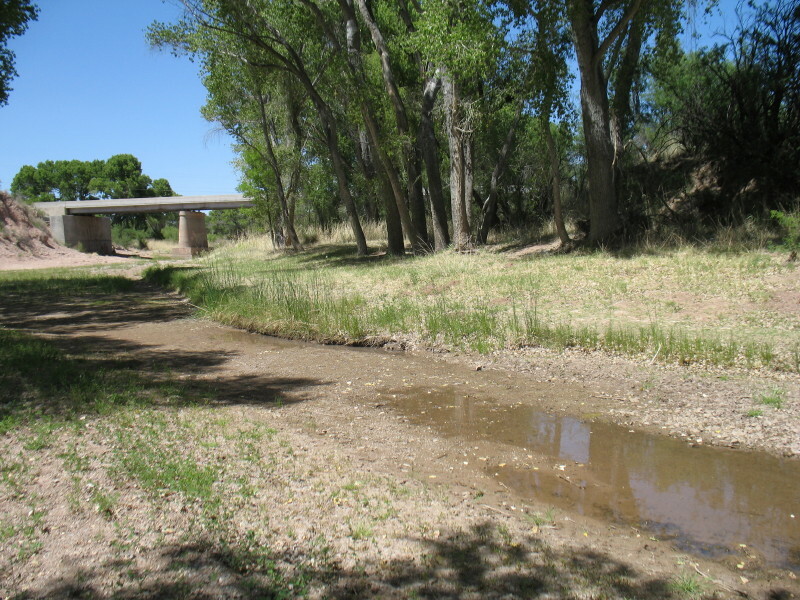 First, we are going to check the state of the river at the Highway 90 crossing, for future hikes. The highway is ten miles away, probably a bit more than that through Sierra Vista and then ten more back to the river on Highway 90. There is more water here upstream from where we were. The corridor between the column of trees is smaller. 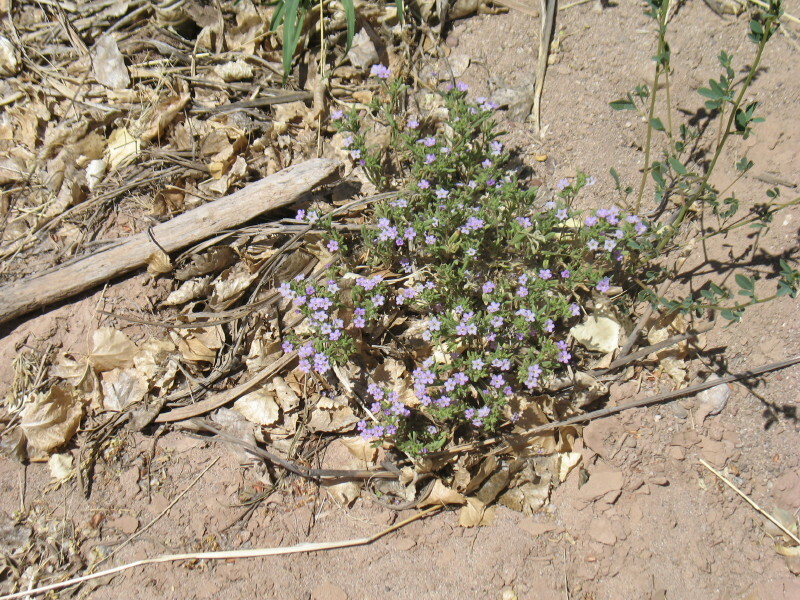 The vegetation is thicker. It may be that the going would be rougher, once the popular trail thins out. It could mean some bushwhacking in the brush. It may only be like this around the bridge. 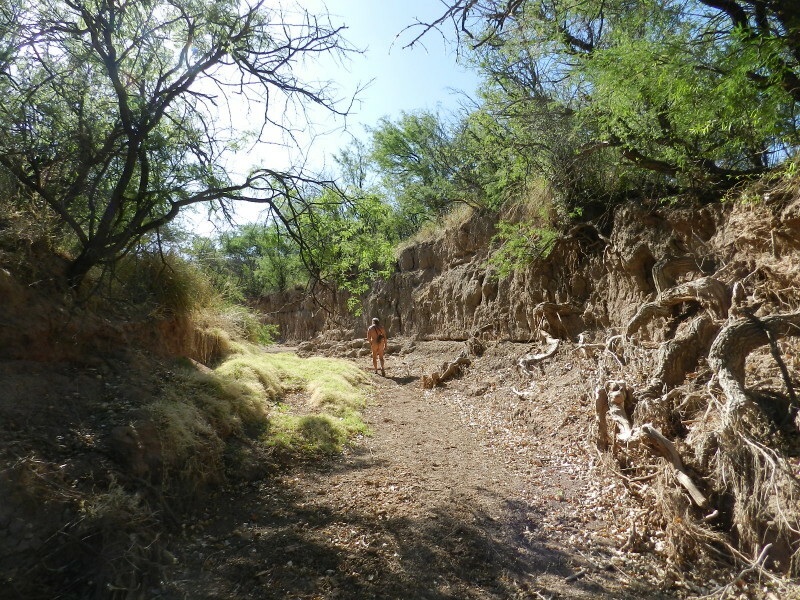 I have a better idea, but I’ll have to research deeper before a future trek in this part of the San Pedro. What could keep me from paradise, after I have tasted of it? This one will definitely go into the bucket list for another time. Next on the agenda, DF knows a road that climbs up into the mountains. 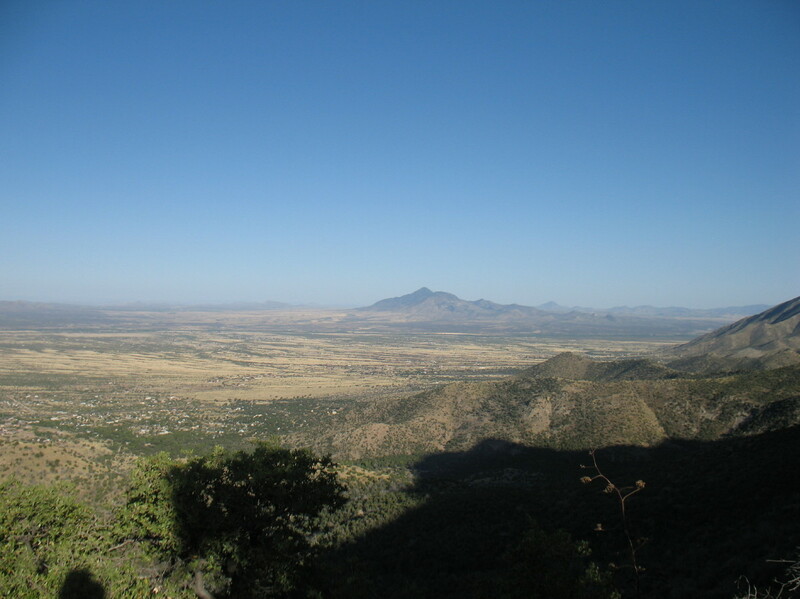 When DF first moved to this area from upstate New York as a teenager, she would climb up Miller Canyon at night under a full moon with no fear. These days, it is a tremendous climb. 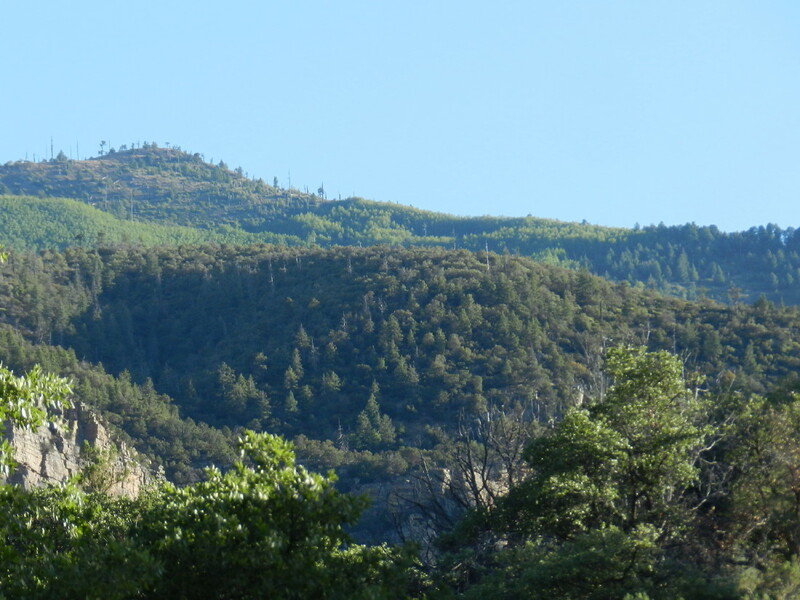 We would have to bear our own water up a steep grade, well over a mile higher that the foothills where we would start. She wants to see some of her old stomping grounds, today. 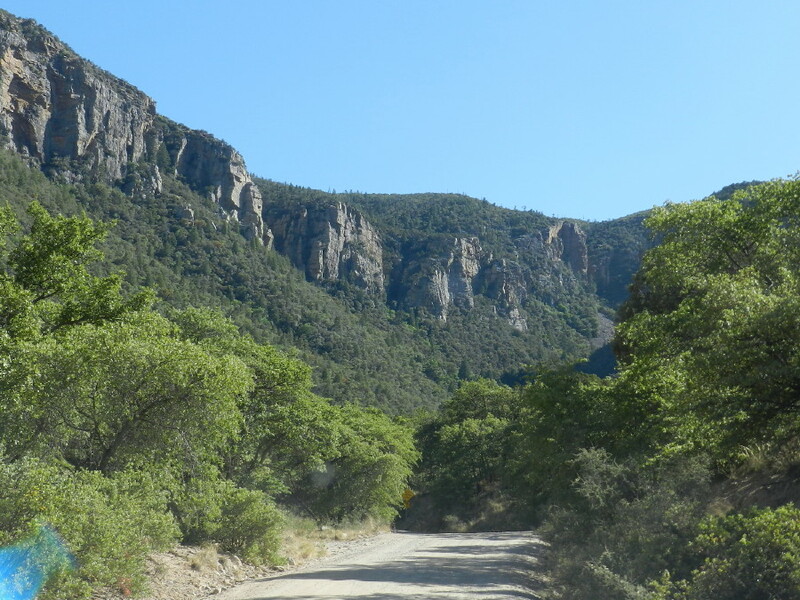 This road will take us to a high elevation, perhaps then we can cross a ridge toward Miller Peak with less climb, or so we think. 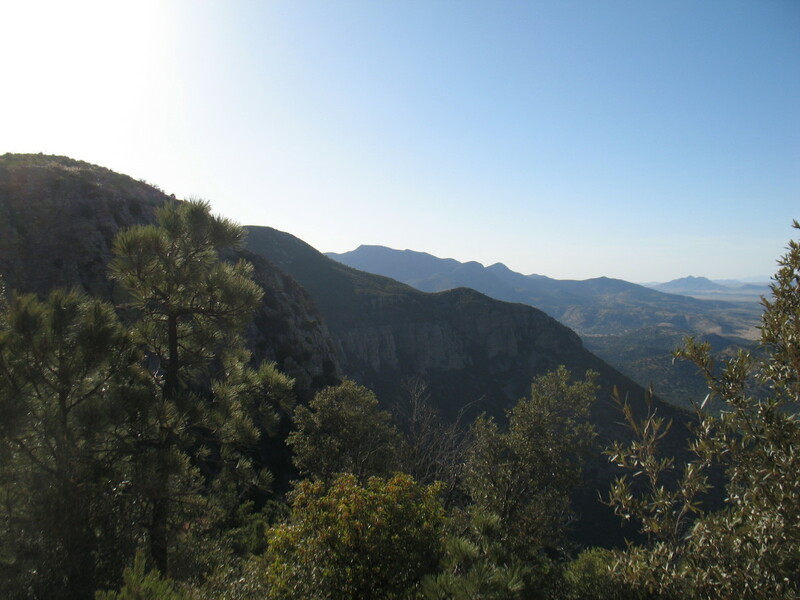 It is also a good idea to check out the foliage and terrain up there, before the eventual backpacking trip. The road up the mountain starts through an old residential neighborhood in the canyon. Curiously, after stalking deer in the river, we pass a woman who has probably 20 deer in her front yard! 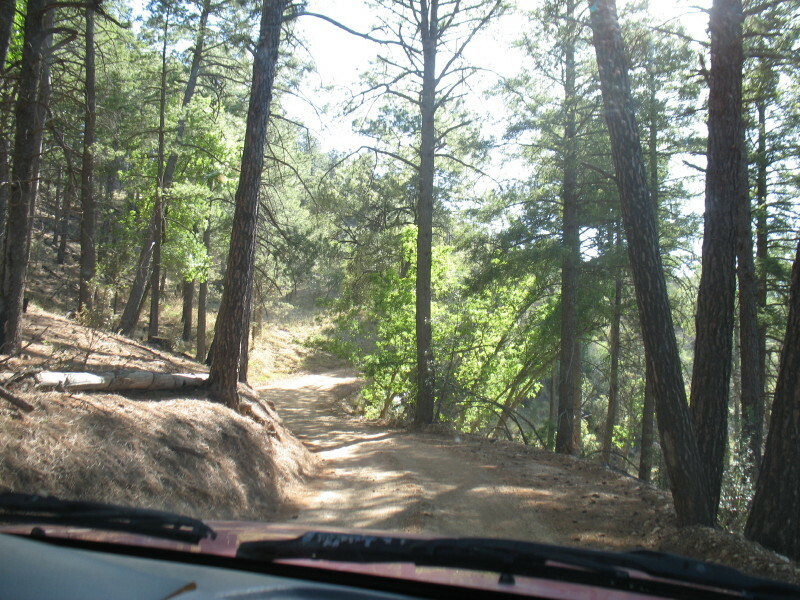 This curving mountain road goes through a camping area and turns to dirt. After it turns to dirt, it is an upward grade all the way. I have no idea where it leads. DF tells me of a waterfall. It is exciting as it narrows and there is little room to pass the oncoming vehicles. There are no guard rails with steep quick cliff falls. We realize that if wrapping around a tree doesn’t kill you, the extreme fall will. The views are fantastic. 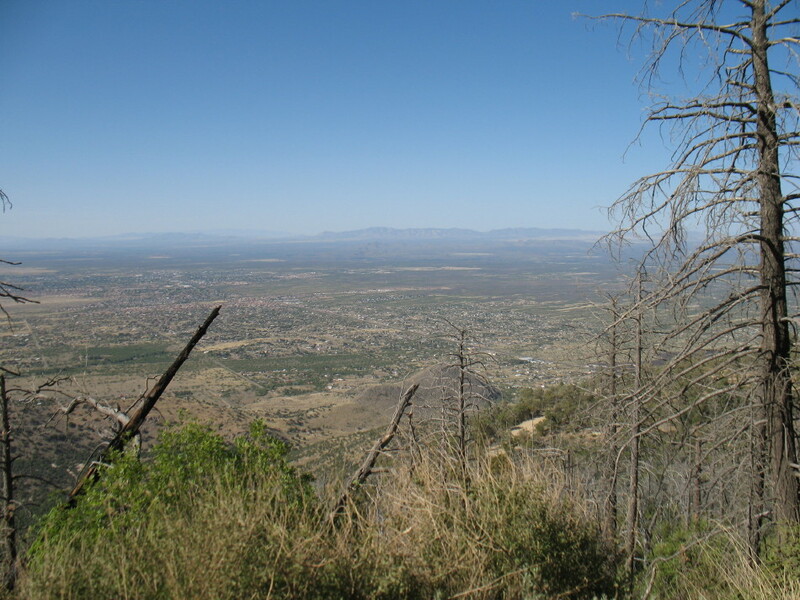 We look down on Sierra Vista and Ft. Huachuca, which are far below, as if from a high flying airplane. I playfully slug DF in the leg to express my fun and that she has been holding out on telling me about this jewel. Eventually, we are in pine forests. There had been a fire. 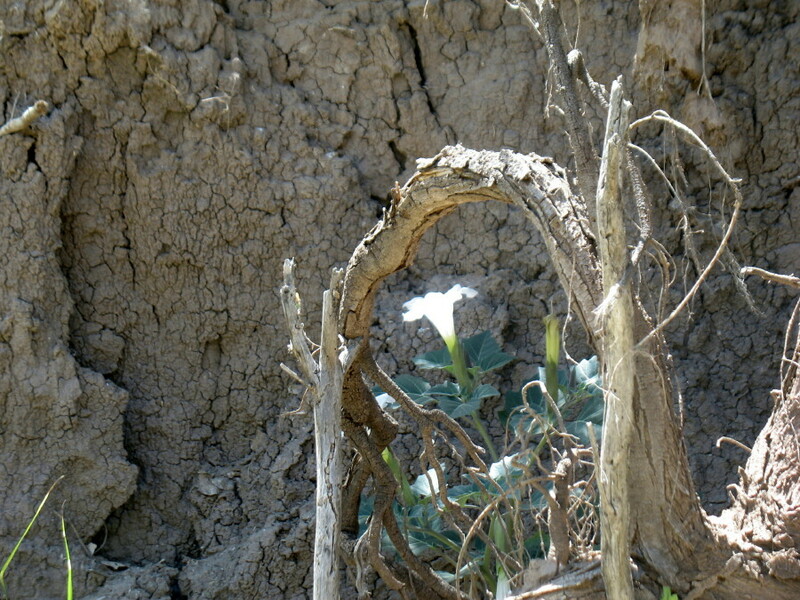 The vegetation is just recovering in many places, some are spared. 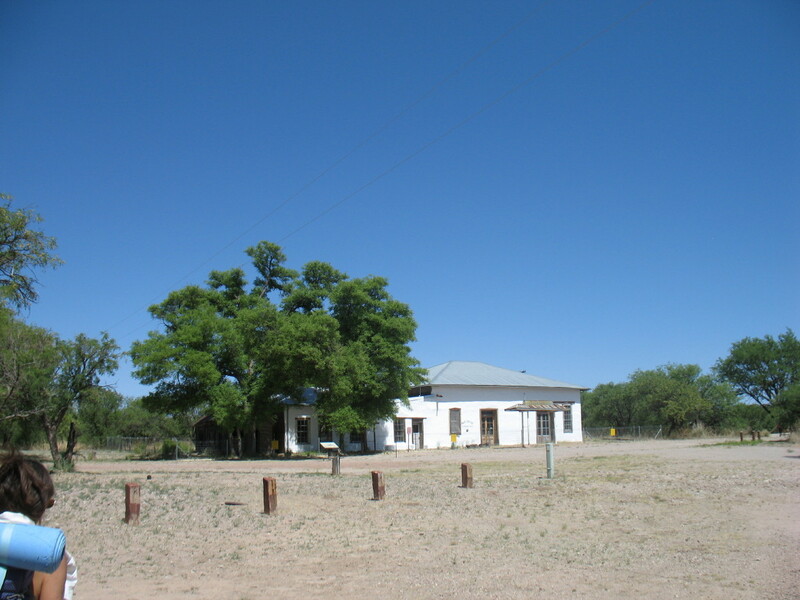 The road ends in a parking lot and a day use picnic area. I collect information on trails. I have to put on my kilt and DF her sundress to walk around. 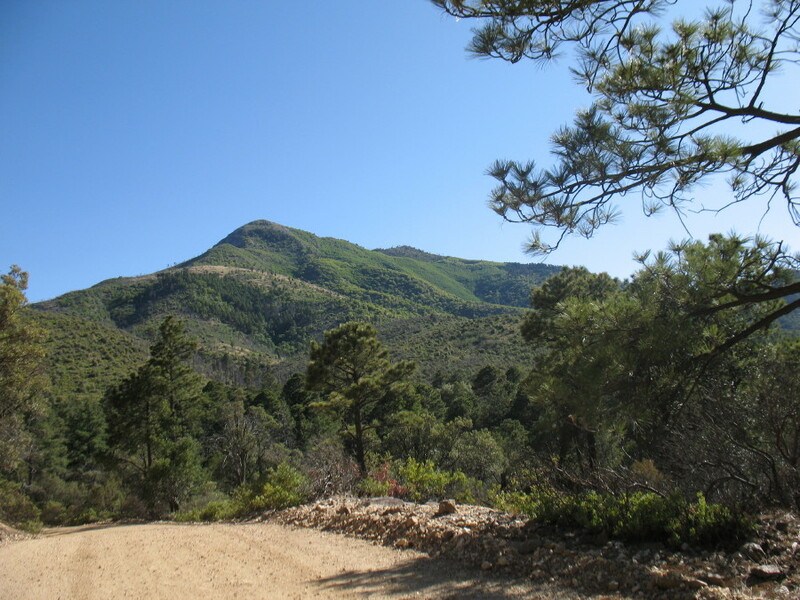 I’ll have to dig deeper to check out this as a route to Miller Peak. The vistas will be spectacular. The third thing on today’s list is to visit an exceptional Italian restaurant that DF knows and to have a birthday feast. Back at the base of the hill, I park in a day use lot. I arrange the SUV so that the open car doors will hide us as we change. A young couple is taking selfies across the street in front of a kiosk. 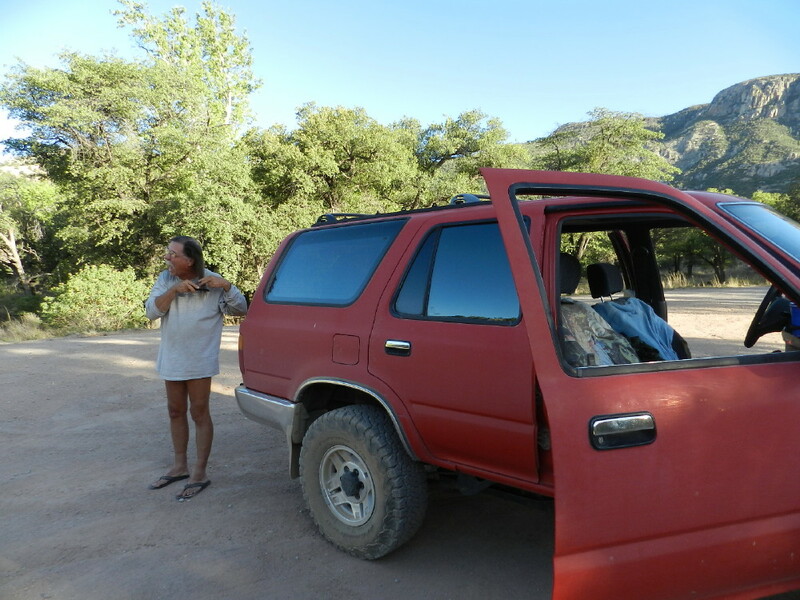 We get out, collecting our nicer clothing and placing it over our three days out in the wild hiking naked bodies. We’re a little raspy but passible. We are not in the mood to bear too much hassle hiding that we are changing. We defiantly practice sloppy stealth naturism for the few minutes that it takes to get presentable. On the back patio of the restaurant, we have a table to ourselves. The incense of the blooming honeysuckle, which curls along the rot iron fence next to us, is constant. The food is delicious and of quality. Many details are imported from Italy, or made from scratch. We continue our carnuding home. We drape clothing over ourselves like a pair of paper dolls at the border patrol checkpoint. The next morning, we dress for work.